Round/Oval Baskets Are Used Table Service Items For Use In Cafés, Diners, Restaurants, Cafeterias And Other Foodservice Applications. Round/Oval Baskets are made of wrought iron, stainless or galvanized steel or aluminum materials for long lasting durability and dependability. Various recognized brands offer a wide selection of baskets designed to display breads, crackers, fruits, cookies and more in restaurants, cafés, diners, cafeterias and other foodservice applications. Ring, Thatched, Scroll, Wire, Whirly, Fry Basket or Pail design types are available in Stainless, Black, Chrome, Brushed Copper or Galvanized finishes and various dimensional sizes and package quantities. Square/Rectangular Baskets Are Used Table Service Items For Use In Cafés, Diners, Restaurants, Cafeterias And Other Foodservice Applications. Square/Rectangular Baskets are made of wrought iron, stainless or galvanized steel or aluminum materials for long lasting durability and dependability. Various recognized brands offer a wide selection of baskets designed to hold or display napkins, food items, fruits, cookies and more in restaurants, cafés, diners, cafeterias and other foodservice applications. Swirl, Leaf, Circle, Grid, Looped, Scroll, Wire, Fry Basket and Checker design types are available in Stainless, Black, Chrome and Copper finishes and various dimensional sizes and package quantities. Bread Baskets Are Used Table Service Items For Use In Cafés, Diners, Restaurants, Cafeterias And Other Foodservice Applications. Bread Baskets are made of wrought iron, stainless steel, aluminum or polyrattan materials for long lasting durability and dependability. Various recognized brands offer a wide selection of baskets designed to display breads, crackers, fruits, cookies and more in restaurants, cafés, diners, cafeterias and other foodservice applications. Scroll, Leaf, Woven, Splayed and Baguette design types are available in Conical, Oblong, Round, Oval, Rectangular and Tall/Lean shapes and various dimensional sizes and package quantities. Cone Baskets Are Used Table Service Items For French Fries, Appetizers, Dips, Chips And Other Snack Foods In Cafés, Diners, Restaurants, Cafeterias And Other Foodservice Applications. Cone Baskets are made of wrought iron and stainless or galvanized steel materials for long lasting durability and dependability. Various recognized brands offer a wide selection of conical shaped baskets uniquely designed to serve french fries, appetizers, dips, chips and other small food items in restaurants, cafés, diners and other foodservice applications. Types and styles include 1, 2 or 3 Cone, Mini Fry Basket, French Fry Baskets, Ring Design, w/Ramekin(s), Coil, Slanted Coil and more with various Black, Satin, Stainless, Silver and Hammered finishes. Available in range of 3-3/8 to 10-1/2 inch diameters and 3-1/4 to 13-1/4 inch heights. 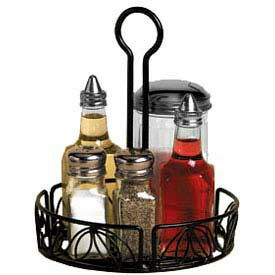 Condiment Racks Allow Eye-Pleasing Presentation Of Condiments In Restaurants And Other Foodservice Environments. Condiment Racks are available in a variety of styles and sizes to accommodate any number of condiments. All racks are made with a center handle for easy transport. Condiment rack quantities vary per style. Choose from several trusted brand names. 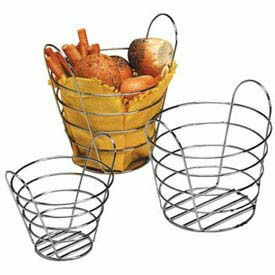 Tabletop Baskets Transport And Display Bread, Appetizers And More. 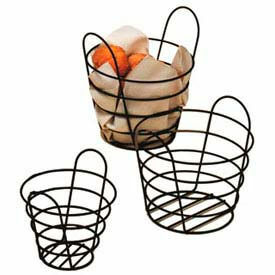 Tabletop Baskets are made with metal and wrought iron for long lasting durability. Built-in ramekin holders add convenience for dips, salsa and other complements. 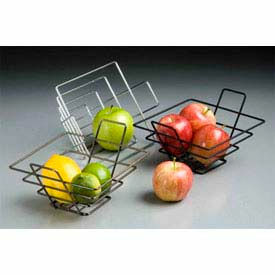 Round baskets available in 9"D and 12"D. Oval Baskets measure 6" x 9" and 11" x 8". Large Chip and Dip Baskets come complete with black 4oz ramekins. 2oz ramekins are sold separately. Available with Black or Chrome finish. 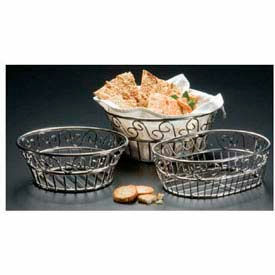 Birdnest Baskets Are Used For Displaying A Variety Of Breads, Appetizers, Condiments And Snacks. Birdnest Baskets are constructed of steel wire with a variety of color finishes for long lasting durability. 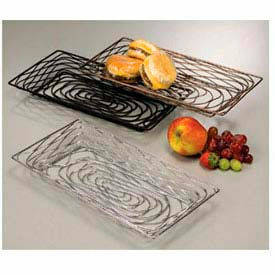 Birdsnest design available in a variety of shapes and styles provide unique presentations of foods. 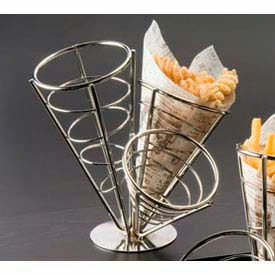 Styles areBirdsnest Design, Condiment Rack, Conical, Oblong, Oval, Rectangular, Round And Thatch. Colors areBlack, Chrome and Copper. Dimensions vary per style.